Harms Carpet One Floor & Home, founded in 1959 by Jim Harms, started as an 800 square foot space in South Toledo. When Jim opened the store, his goal was very clear: offer customers from all over Northwest Ohio the best purchasing experience. In 1969 Harms Carpet moved to a 3,200 square foot space in the Colonial Village Shopping Center at Heather Downs and Key Street and continued to expand the store. Jim's son, Randy, joined the business in 1970 and helped his father open a second store on Tedrow Road called The Remnant Place. Eventually, the company outgrew the Colonial Village location, and the family decided to move both stores to its present location at 1007 Key Street in Maumee. Formerly a grocery store, this place allowed them to consolidate their showroom, remnants, and warehouse all in one space. In 1998, we decided to join the Carpet One cooperative. With this, Harms Carpet One became a part of the largest floor covering buying group in the world with the buying power of over 2800 stores. Because we are part of a cooperative and independently owned, our sales support the local community. Our affiliation with Carpet One enables us to offer the best warranties and prices in the market. In the early 2000's, Randy's sons, Jake and Steve joined the company, becoming the third generation of family members to take up the flooring business. Today, the place that began as a tiny neighborhood carpet store is an amazing 12,000 square foot showroom display. 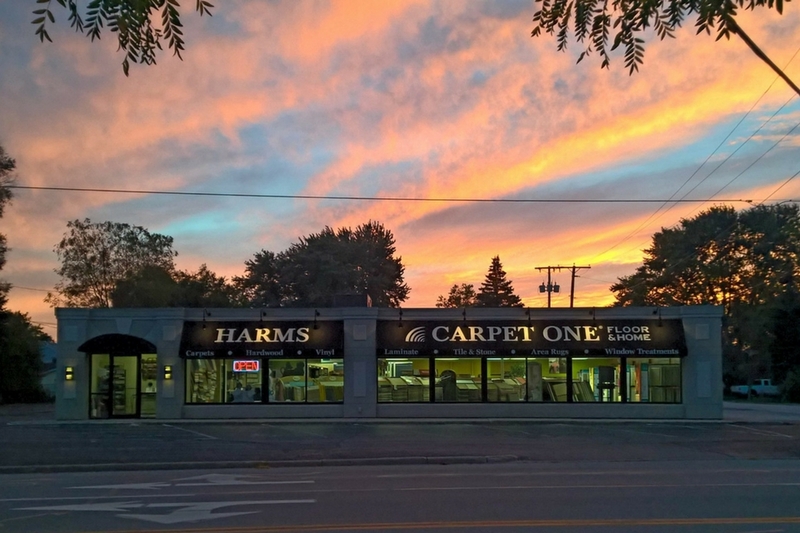 The success of Harms Carpet One is thanks to all the customers’ referrals that continuously recommend the store as the best flooring place in the Maumee area. Our compromise is to offer the best products, excellent service, and quality installations. In Harms Carpet One you will find the biggest selection of carpet, tile & stone, hardwood, laminates, resilient floors, window treatments, area rugs and more. Berkey, Bowling Green, Curtice, Grand Rapids, Haskins, Holland, Lambertville, Lyons, Maumee, Millbury, Monclova, Oregon, Ottawa Lake, Perrysburg, Rossford, Swanton, Sylvania, Temperance, Toledo, Waterville, Whitehouse, Woodville, Ohio, Michigan. We are your one-stop-shop for all your flooring and home renovation projects. Visit us today! Our Maumee showroom is located on Key St., just past the Lucas County Rec Center, near the Anthony Wayne Trail.